Once the date has been set, the invitations sent, and the venue selected, the list of to-dos keeps going. One of the tasks probably (or hopefully) on that list is to choose the right music for your wedding. There are usually two big parts to a wedding: the ceremony itself (with more traditional tunes, but couples can always break the mold) and the reception (where the party happens). Within these two larger pieces of the overall wedding puzzle, there are certain moments that require their own song, like the first dance. What do you and your fiancée want to hear? Before doing any research or making any decisions, take 20 minutes to jot down specific songs and bands that are your favorite, ones that must be played at the wedding. Then you can compare your list to your fiancée’s and see if there’s any overlap. If there’s not, that’s okay too! But at least you have a start on the kind of music you definitely want played. We’re sure you’ve thought a great deal about your venue, but this time we’re asking you to compare the music you’re considering with the space and layout of your venue. Is there a dance floor? Are you in a historic mansion? Is the venue entirely outside? What are the acoustics like? Think about the kind of music that will pair with the venue. Speak with the venue’s event coordinator to see how past weddings were set up in the same space. What kind of music did they have and how did it work out? Sometimes the coordinators can also put you in touch with a few past clients so you can speak to them about their individual experiences. Research local live bands and DJs. The battle of the bands. This is a serious question for couples, but in the end, whichever option you go with will be the perfect choice for your wedding! During the research stage, consider the pros and cons of both musical talents. Live bands produce a certain ambiance and vibe for the evening; a good tip is to watch previous performances and speak with past clients to see how the band jelled with their audience. 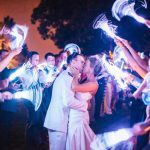 Seasoned DJs offer couples the expertise of guiding you towards certain types of music that might fit over others, and if you work with a company (like All About You) that operates a completely wireless system, then your venue doesn’t affect the music. Now you know how to choose the right music for your wedding, and All About You Entertainment is your source the for best DJs for your playlists. 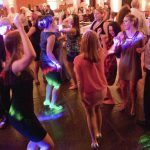 Our DJs and wedding coordinators have helped countless couples in the Savannah and Hilton Head areas!